As promised, I continue my pregnancy summary. Because everyone loves a good pregnancy tale. 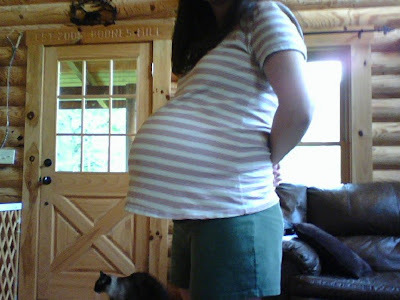 The above picture is from 29 weeks. I was already getting the comments from random strangers. You know the ones. You look like you're going to pop! You must be uncomfortable! You must be due any day now. Are you having twins? 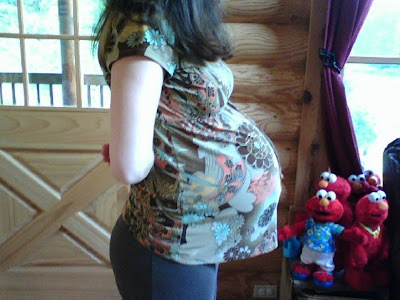 Of course, once I confirmed that I was having twins, there was a plethora of horror stories that every single person I met insisted upon sharing. My neighbor was on bedrest for 12 weeks, in the hospital, when she had twins. I got so big I couldn't walk at the end. I had to use a wheelchair. I know someone who had twins and after she had the first one it was another EIGHT hours before she gave birth to the second. If you are reading this and are pregnant with twins, just IGNORE all the horror stories. They will do nothing but make you neurotic. Which I certainly was. But my doula made me feel better. She started coming to meet with Paul and I in our home. She gave us videos to watch, books to read, and activities to complete. Something about TAKING action towards the birth was so reassuring. It really made me feel in control, even though I knew that bottom line was that anything could happen. 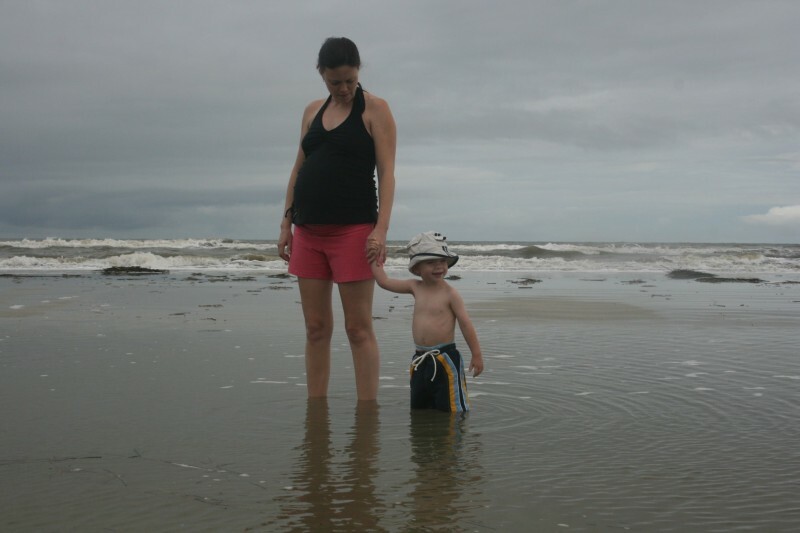 Pierce and I at Hilton Head around 30 weeks. By this time I was uncomfortable for sure. I had to stop every hour at least for a bathroom break. I had stolen the couch cushions from my coworker's office to pad my office chair and offer more support to my back. When trying to get out of bed, I was like a floundering whale, rolling onto my side, kicking my legs off the bed, and struggling to get myself up. But honestly, it just wasn't as bad as I had expected it to be. This was the point I started having trouble finding shirts that actually covered my belly. Even some of the XL shirts left a small gap. I was constantly pulling my shirts down, for fear of rendering shock into someone who actually caught sight of my belly in the raw. My belly button was definitely poking out by now (which it didn't do in my first pregnancy) and it was tender. The only stretch mark I got the whole pregnancy was actually inside my belly button. A good place to have a stretch mark if you ask me. 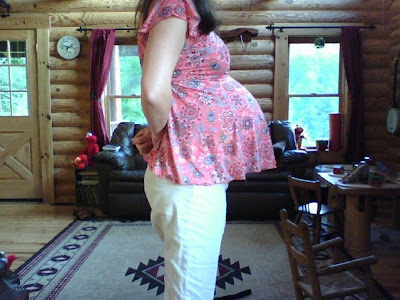 34 weeks pregnant with twins. Look at that. 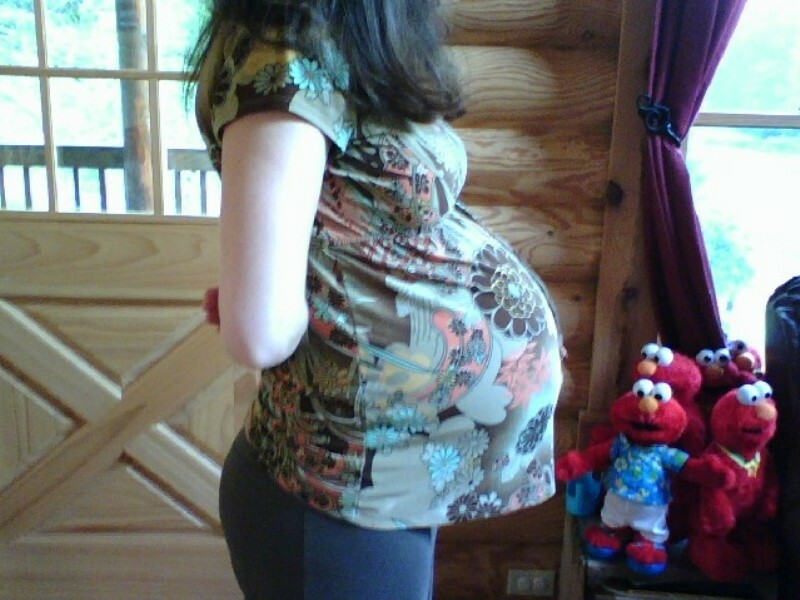 My belly was bigger than FOUR Elmos! I continued to have ultrasounds with each visit to my ob/gyn. The boys looked great except Baby B continued flipping back and forth between breech and head down. Every week he was in a new position. At one point, he was positioned so crazy that my doctor couldn't see his head, after trying for a good 30 minutes. He called in an extra ultrasound tech and she couldn't find it either. I joked about having a headless baby but neither one of them seemed to think that was very funny. 34 weeks marked a big milestone. Because my doctor said that after 34 weeks if I went into labor he wouldn't try to stop it. So I could labor at home for a while and then go in to the hospital when the time came. Not that I was wanting to have them so early, but it was nice to know where I was in the grand scheme of things. From research online, I knew that most twins are born between 36 and 37 weeks. Meanwhile, my blood pressure was starting to go up some. You probably remember that I'd had preeclampsia with Pierce, so I was hoping I could just keep things calm enough this time to avoid growth restriction and induction. Keep in mind this is JULY. I am this huge in the middle of summer. This shirt is an XL and it's just barely getting the job done. I had about 4 shirts at this point that I could wear. I was so hot all the time that I frequently thought the air conditioning in the car was broken. I kept complaining to my husband that we needed to get it looked at. Really, it was just my personal thermostat that was out of whack. I completely lost all concentration at this point. I'm an avid reader, but I couldn't read anything except suspense novels during this time. Nothing else would hold my attention. The more my stomach stretched towards the Virginia state border, the more I was ready to give birth. As the possibility of another weekend sitting around loomed, I just knew I had to do something to make the time go by. So we took a side trip to do some shopping with my mom and eat out. She couldn't believe I was still running around being so huge. It actually felt better to be up and moving, for the most part. Meanwhile, Baby B was breech again. When he turned, it was so painful. He would kick against my organs and scramble, trying to get into position. I was really starting to worry about it, as was my doctor. He kept asking if I was sure I didn't want to do a c-section. But I was adament that if he was breech when Baby A was born, that we try to turn him. My doctor was uncomfortable, yet willing. He had a specialist in such matters on call for backup, should it come to that. 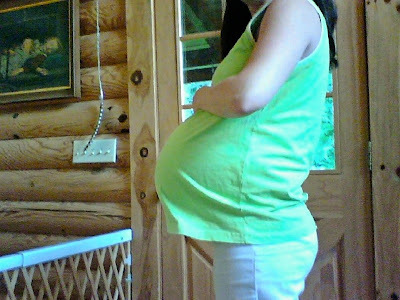 38 weeks pregnant with twins. YIKES. I began to feel kind of desperate at this point. I didn't want to be induced, but when on earth would they come? At my 38 week 2 days appointment, dilated 3 centimeters, I begged my doctor to strip the membranes. He obliged, somewhat reluctantly, because he was going to be out of town that weekend. But Baby B was head down at least. People always ask - so yes, stripping the membranes hurts. But HELLO, you're about to go through labor. Believe me, comparatively it is not a big deal. The next day I had contractions. Off and on all day. I'd get so excited only to have them fizzle out. I had Paul walk around downtown with me during lunch to try to make them stick. Every morning when I'd wake up to have gone through another night without labor, I was so disappointed. My doula (when I had called her in frustration) had explained that I was most likely to go into labor in the middle of the night. That Friday was my 13 year wedding anniversary. 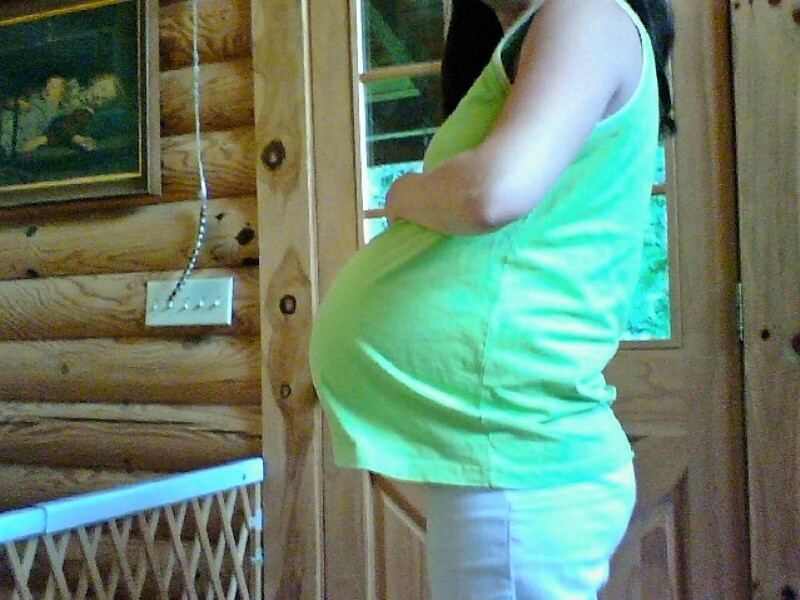 I was 38 weeks 3 days pregnant. I went to work and had contractions all day, as usual. Nothing concrete though, although some of them were getting kind of painful. That evening, Paul and Pierce and I went out to eat at The Homeplace, a homestyle restaurant in the mountains that has the best southern cooking around. I had gotten Paul this huge cabana style tent for our anniversary, which he set up in the middle of our living room. He and Pierce played in the tent all evening. It took up the whole room it was so big. Click HERE to read the birth story. I love hearing about your pregnancy. Looking forward to your next pregnancy post! Oh, and why do people share "horror" stories with people who are pregnant!? It's just cruel. Oh my gosh! I can't believe you made it this far with twins! Way to go! Can't wait for the next post! You look awesome in those pics. If anyone has the bod to carry twins and still look like they could run a marathon, it's you. 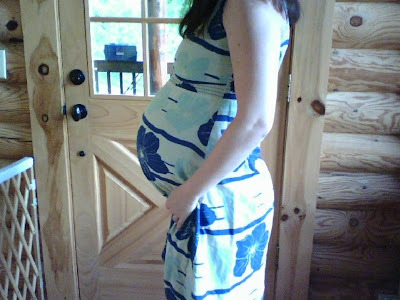 I love how even though you are pregnant with twins, you really only look pregnant in your belly! That is crazy. I know it's probably not how you "felt", because you are so much more aware of your body than anyone else, of course. What a great "scrapbook" of your pregnancy. You looked AMAZING carrying twins. It must help that you are a runner!